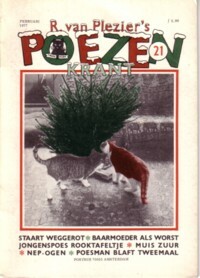 Here are some covers of the oldest X-Mas zines that I received. They were made by Aad Duineveld, Piet Schreuders and Aart Clercx. Like I said yesterday, I gave 90% of my zines collection away to Het Kleine Blaadjes Museum in Eeklo. I only kept a few hundred. I had always hoped to write a book about these zines, but after our children were born I began to realise that I would never do 1% of all the projects that I had in mind, and I began to give many things away. If I had known that I would ever write a blog like this, I think I would have kept more stuff myself. Although, I wouldn’t know where to keep it. Het Kleine Blaadjes Museum was housed in Eeklo, in a place named De Media. De Media was run by Jan de Boever and Emma di Lemma. It was a combination of a concert hall, a café, a gallery and many other things. Jan loved fanzines even more than I did. 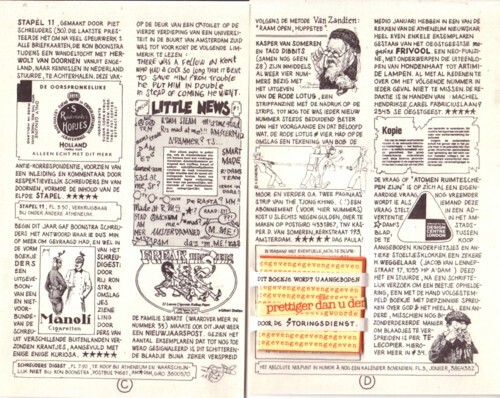 In 1989/90 he organised an exhibition that travelled through many European museums, named ”Fanzine as an object” I was among the people who were asked to make a one-of-one zine for this exhibition and remember how proud I was that my zine was in the catalogue. Most of the other participants operated in the mail art scene; I never had much interest in mail art, so I hardly knew anybody of the other artists. I remember that I walked though the museum thinking that the zines I had at home were far more interesting than what I saw on the museum walls. 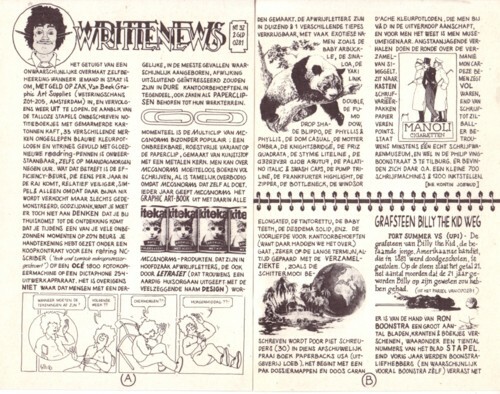 One of the first zines that I made was named Writtenews , and I am very happy that this zine had a circulation of only a handful of copies, of which hopefully not much still exists. The zine was hand lettered, zeroxed, A5 sized, and had 2 to 4 pages. I made about 40 issues. I just read the issues that I found back and am amazed to see that it looks very much like what I am doing now, 25 years later. As a person I feel completely changed, but I cannot see much of that change in what I produce. The fanzine culture is for me linked with the cassette culture, just as blogs and mp3’s go together. So, in order to come up with a suitable soundtrack for today, I picked my copy of the Cassette Culture tape. It must be one of the most copied tapes of the world. I heard as very late, and i got a copy without any information. I think people were asked to send in answers to questions that were distributed on a photocopied list. These answers were on a cassette, of course, and somebody edited all the responses into a c90 tape. A nice glimpse in a gone world. It is all about the American cassette culture, which was very different from what was happening in Holland. The same goes for fanzines. 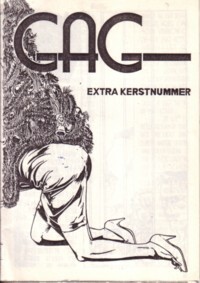 In America a circulation of a few hundred copies was considered small, while in Holland most of the best zines/tapes were distributed in circulations of 50 copies or less.